You are currently browsing the tag archive for the ‘grows larger’ tag. 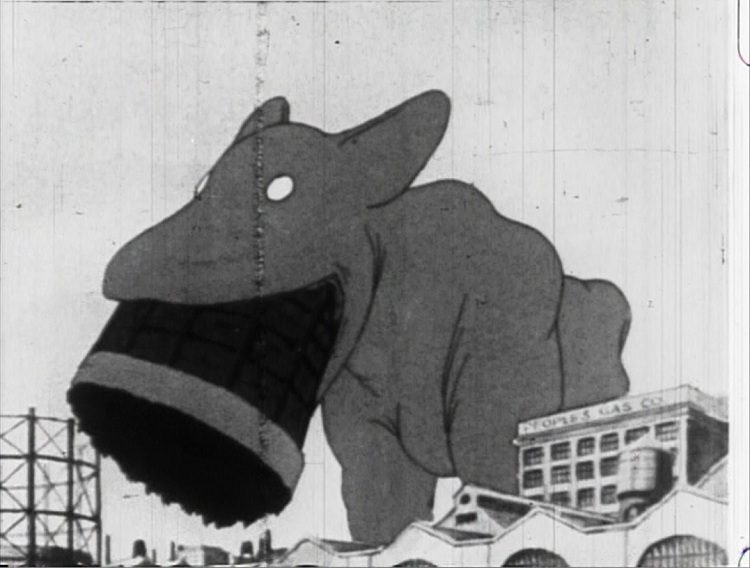 ‘The Pet’ is the second of the three ‘Dream of the rarebit fiend’ films Winsor McCay released in 1921. It is arguably the best of the three, and probably the best of all Winsor McCay’s films: it combines a well-executed story with a perfect command of animation. It’s too bad it isn’t more well-known. In ‘The Pet’ a woman dreams she adopts a small animal that grows larger and larger every day, eating the cat, everything on the table, the furniture, and later on, a tree, a car and some buildings, until it explodes. The dream is totally believable with its inner logic and its wonderful execution. The growth of the animal is shown with a very imaginative use of perspective and beautiful backgrounds. For example, when the pet grows to gigantic proportions, we see it stride behind some very high buildings, towering over our heads. More than 25 years later Tex Avery would return to the same subject in ‘King-size Canary’ (1947).